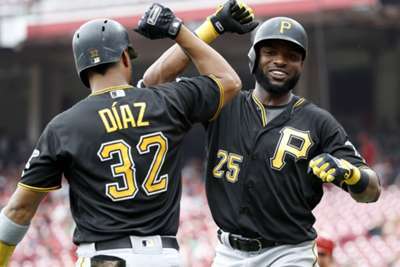 The Pittsburgh Pirates stretched their winning streak to nine games as they topped the Cincinnati Reds 9-2 on Sunday. Pittsburgh took an early lead on a two-run home run from Gregory Polanco in the first inning. Max Moroff tallied an RBI single with one out in the second, before Corey Dickerson and Starling Marte followed with home runs to help the Pirates pull away. Dickerson finished the game with four hits and three runs scored. Marte tallied three RBIs for Pittsburgh. The 4th time your Bucs have gone B2B this season. Matt Harvey, who has been at the centre of several trade rumours, allowed eight runs and eight hits in 3.6 innings on the mound as Ivan Nova picked up the win for the Pirates. The win moved Pittsburgh to 51-49 for the year with their last loss against the Washington Nationals on July 10, while Cincinnati fell to 43-56. Los Angeles Dodgers outfielder Matt Kemp tallied two RBIs and scored three runs in his team's 11-2 win over the Milwaukee Brewers. Chris Sale threw six shutout innings and struck out nine in the Boston Red Sox's 9-1 victory against the Detroit Tigers. The top two hitters in the Baltimore Orioles' line-up Tim Beckham and Joey Rickard combined to go 0 for nine with three strikeouts in a 5-4 loss to the Toronto Blue Jays. Cardinals reliever Brett Cecil pitched just 0.3 of an inning but allowed three runs and four hits against the Chicago Cubs as St Louis fell 7-2. 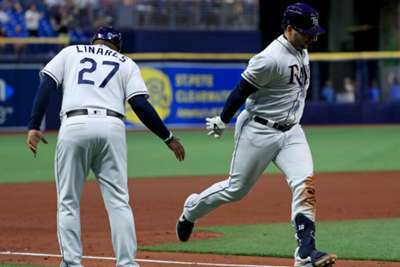 Daniel Robertson hit a pinch-hit grand slam in the bottom of the ninth to give the Tampa Bay Rays a 6-4 walk-off win over the Miami Marlins. Two of the top teams in the National League will begin a three-game series in Philadelphia on Monday. All-Star Ross Stripling is set to start for the Dodgers and Zach Eflin will take the mound for the Phillies. The Dodgers recently acquired star infielder Manny Machado from the Orioles, while Philadelphia is reportedly looking to upgrade their roster before the July 31 trade deadline.